A man meets a lady who falls instantly for the man. The man has an affair with the lady, knocking her up. The lady is forced to give up the baby for adoption and live a new life. As time goes on, the lady and the man, and his wife, cross paths once again. The man and the lady renew their forbidden affair as the wife catches on all while the man searches for the long lost child. Sound like the plot of a soap opera? It’s not. 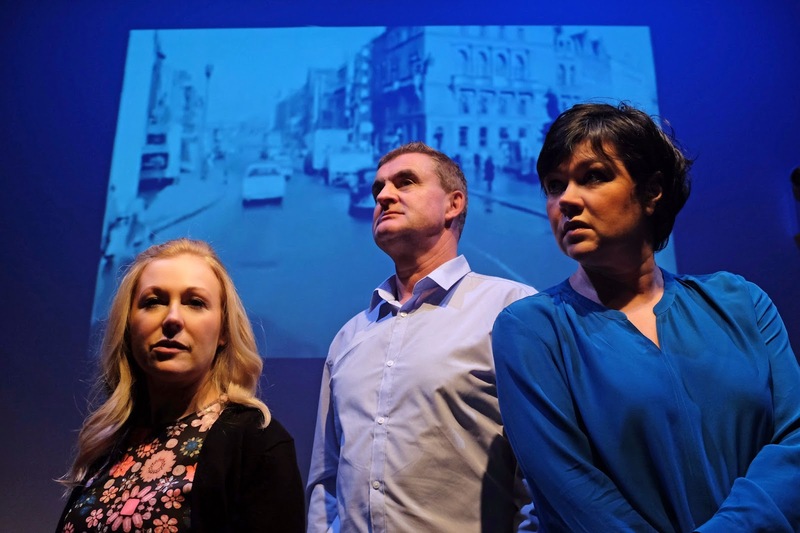 In Brona Crehan’s Pillow on the Stairs, three people recant their history through intertwining monologues. With a storyteller’s dream as the structure, Pillow on the Stairs is an intersecting trio of monologues that tell the story of three people and their connection through the past and how the choices from the long-ago altered their future. Set in Ireland, the piece follows the lives of Annie, Margaret, and Jim, three souls searching for closure. The model of a monologue play requires exquisite storytelling skills. It needs to be a little more than a live book on tape. Believing you are experiencing the story is essential. Crehan’s storytelling skills are present but it seems to lack drive. The story is not necessary an active one but the monotonous personal arias may be the cause of the dead air moments. This is not a play that wants to be restructured but it would be greatly aided by momentum and liveliness in storytelling. Playwright Brona Crehan, Jacqueline Kealy, and John McConnell as Annie, Margaret, and Jim respectively had moments of wonderful storytelling. Though the majority of their respective tales allowed for monotony in manner, the moments of animation and emotion were special. Jacqueline Kealy as the damaged Margaret brought an excited aura to her saga. Margaret has clearly been through a lot, still battling the demons of the past. John McConnell, who happens to be a dead-ringer for Robin Williams, played a very active part in the love triangle but he’s passive demeanor allowed you to somehow relate to him despite his actions. Crehan’s portrayal was quite interesting. She almost made you believe her character was over the whole situation, pain free. Her only downfall was, despite quite an intimate space, her vocals were especially soft, making it difficult to hear her story. With a barebones design with only three identical chairs and a wall of color, director John Keating went for the minimal style, relying heavily on the actors. With a simplistic approach, it made every movement or sound was very specific, though they are questionable and unclear. Changing the dynamic and varying space may have appeared interesting, it added nothing to the storytelling except for the audience searching for the reason behind the stand and cross. The space at the cell is virtually a blank canvas of opportunity, but for a sit and speak play, having a wall of vents in the audience’s line of vision was a bit disappointing. But this wall was essential for the overall design of the show. Gertjan Houben played an integral role as lighting and projection designer. The top of the show began with a beautiful projection of Dublin, setting the scene and establishing the world of the play. From there, the white wall that became the projection screen was home to a colorful lightshow including a distracting orb. The round shape of color occasionally shook, sometimes stood still, and would alter shape at times. What it had to do with the story is a giant question. If it did have a deeper meaning, it did not resonate properly. The incidental music and sound by M. Florian Staab added a nice ambiance and soundtrack to the piece. It helped fill gaps between sections but perhaps a bit more could have helped the moments of dead air. Overall, Pillow on the Stairs is a show filled with heart but it is lacking the “wow” factor. Sometimes less is more, but when too little is just not enough, it makes the vision incomplete.